Isai Rea with high school seniors who participated in UC Berkeley's bridges Senior Weekend earlier this year. Isai Rea, an Edison Scholar recipient, with his friends at a UC Berkeley football game. Isai Rea was surprised with the $40,000 Edison Scholars scholarship check in 2015. Isai Rea at an Edison Scholar reception in 2015. Edison Scholar Isai Rea with his family. Isai Rea, an Edison Scholars recipient, encourages students of all backgrounds to lead and take action to achieve their goals. 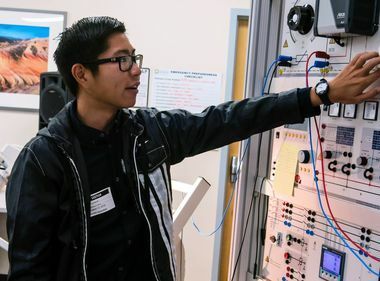 Isai Rea never accepted the assumption of his neighbors in South Los Angeles that as a Latino student, high school was the end of the line for him. “It’s a major accomplishment to graduate high school, but I would get sad that people would celebrate that without looking forward to anything else,” he said. Start looking for jobs, they’d tell him. 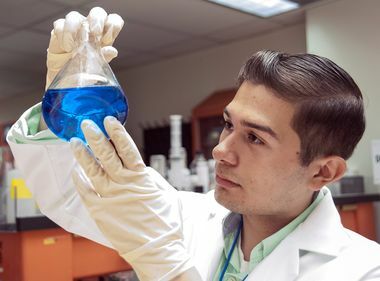 He proved them wrong when he was accepted to the University of California, Berkeley in 2015, but realized his family didn’t have enough money to cover the tuition. Don’t give up. The challenges or obstacles you face will formulate into your success story. 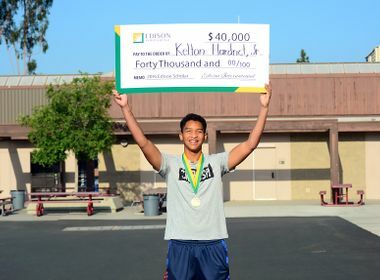 That’s when he found out he had won a $40,000 Edison Scholars scholarship from Edison International, the parent company of Southern California Edison. Rea considers the hour he spent filling out the Edison Scholars application during his senior year at King Drew Magnet High School of Medicine and Science his best investment going into college, and encourages current high school seniors to apply before the Feb. 1 deadline. The high school seniors must demonstrate financial need and plan to be a full-time undergraduate student majoring in the areas of mathematics, engineering, computer and information services, management information systems, natural resources and conservation and physical sciences at a four-year college or university. Applicants also must have at least a 3.0 GPA and either live in or attend public or private high schools in SCE’s service area or attend an eligible high school in the designated area surrounding SCE’s San Onofre Nuclear Generating Station. Rea says he wants to give back and show other students of color that there’s a place for them to call home, even if they feel like they don’t fit in. Training to be an executive director for bridges Multicultural Center, a coalition of seven student Recruitment and Retention Centers at UC Berkeley, he outreaches to young kids in minority communities as well as provides students on campus with the resources needed to succeed. Rea’s passion to change the world through his work in environmental science with an emphasis in humanities has helped him land another scholarship, much to his surprise. Through that funding, he’s getting ready to head his own graduate-level lab research as an undergraduate. “Don’t give up. The challenges or obstacles you face will formulate into your success story,” he said. For scholarship application and eligibility information: scholarsapply.org/edisonscholars.